Build Your Legacy Furniture Collection At A Price You Can Afford! An American Heirloom Furniture Amish 'Classic' furniture piece is a 'Reproduction Antique' of the highest quality. Faithfully following a distinct and premier antique furniture piece. Each 'Classic' furniture piece remains exactly true to the original furniture form and style, using the original joinery techniques. Compared to the original master piece, use of modern glues, fasteners, and finishes enhances quality, and selected components may deploy a minor increase in wood thickness in order to address a known weak point in the original design. Amish 'Classic' chairs are always provided with hardwood seats (although some originals may have used soft wood components for ease of working). American Heirloom Furniture Amish 'Classic' furniture pieces are actually of higher quality and more durable, requiring less maintenance, than the original antique masterpieces that they are modeled upon! An American Heirloom Furniture Amish 'Heritage' furniture piece is a Masterful Adaptation of a distinct and premier antique furniture piece, with some alteration to increase both functionality and durability. Each 'Heritage' furniture piece retains Authentic Period Styling. Compared to the original master piece, use of modern glues, fasteners, and finishes enhances quality. 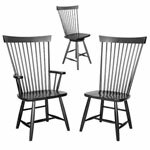 All Heritage chairs are provided with hardwood seats (although some originals may have used soft wood components for ease of working). Variations in both joinery techniques and wood thickness are allowed, in order to enhance strength and durability. Some adjustments of the original form and style are also made, in order to improve functionality compared to the original piece. 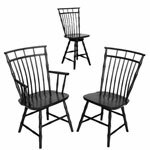 American Heirloom Furniture Amish 'Heritage' furniture pieces are actually of higher quality and more durable, requiring less maintenance, than the original antique masterpieces that they are based upon. Additionally, Amish 'Heritage' furniture usually also offers enhanced functionality compared to the original piece. An American Heirloom Furniture Amish 'Contemporary' furniture piece is a Reformation of a distinct and premier antique furniture piece, with considerable alteration to streamline styling, as well as increase both functionality and durability. Any weak point in the original antique design is replaced with higher quality materials and/or superior carpentry practices. Thus, each Amish 'Contemporary' furniture piece offers higher quality, increased comfort, increased functionality, increased durability, and decreased requirement for maintenance, compared to the original furniture masterpiece that it was evolved from. American Heirloom Furniture Amish 'Contemporary' furniture pieces offer clean Modern Styling with a Tangible Connection To Our Past. Amish 'Classic' and Amish 'Heritage' Pieces - Only The Best Endures! We take lasting pleasure in custom building beautiful legacy furniture pieces that will endure for generations. Whether You choose from our 'Classic' or 'Heritage' Heirloom Collection, every custom 'American Heirloom Furniture' piece is personally signed by the Mennonite or Amish craftsman who caringly built it, specifically for You and Your family to enjoy. Mennonite Furniture Studios offers a wide range of solid hardwood furniture, and specializes in building to order. Chairs, Tables, Cabinets, Beds..... Anything! 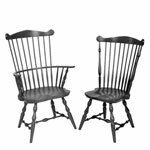 American Heirloom Furniture pieces of the Colonial and Federal periods were built to last by caring men who thoroughly understood their tools, materials and craft. Today our Mennonite and Amish furniture makers undergo a long apprenticeship to develop keen eyes and skilled hands, and these expert craftsmen enjoy building Your furniture with the same unhurried care!